Richard Nickel, a photographer during the 1960’s and 1970’s, famously documented the work of Louis Sullivan, and its subsequent destruction, throughout the United States but most prevalently worked in the Chicago area. This design project seeks to design a public space to house the Richard Nickel Archive. A non-profit organization that collects, houses and distributes much of Nickel’s collection throughout the world. The students approached this design by first investigating and analyzing the underlying structural logic of an ornamental detail from a Louis Sullivan building. The details, once stripped of their decorative flora, exhibit a clear underlying geometric structure which was to serve as a method by which the student could articulate a three-dimensional framework to inform the overall massing of their building. 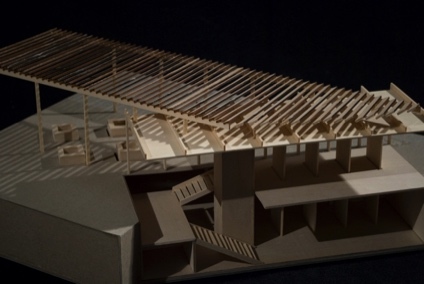 The resulting massing studies were further developed through a series of lighting studies done utilizing physical models, either of the entire building or in spatial sequence. The programmatic components of this design project were for a gallery space, storage and research space in which an invited scholar could study the Sullivan work through its collection of Nickel photographs and salvaged building details.